On Tuesday, July 11 at 7 p.m. Machias Bay Chamber Concerts (MBCC) will present the first of six exclusive summer concerts at the Centre Street Congregational Church in Machias. The opening concert will feature violinist Trond Saeverud, cellist Joachim Woitun, clarinetist Anna Maria Baeza, and pianist Gregory Biss. The program will include: Igor Stravinsky’s L’Histoire du Soldat (in a reduction by Stravinsky), Bela Bartok’s Contrasts, Felix Mendelssohn’s Piano Trio No. 1 in D minor (Op. 49), and a Cello Suite by J. S. Bach (TBA). Singer-guitarist Pete Kilpatrick is the featured artist at the fourth in Peabody Memorial Library’s slate of summer concerts, billed as “Music in the Library,” slated for 6:30 p.m., Friday, July 14. Photo 1: Calais High School Athletic Director Randy Morrison presents Greg Smith the 20+ Year Coaching Achievement Award for his tremendous dedication to athletes from Calais High School. Fantastic job Coach Smith! 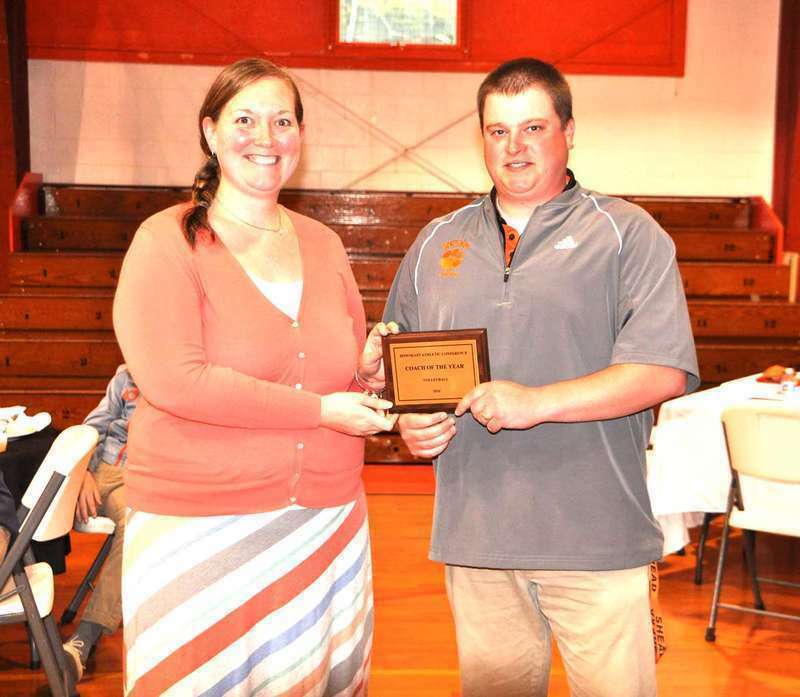 Photo 2: Narraguagus High School Athletic Director John Daley presents Butch Hall the very special Richard Gardner Distinguished Service Award for his many contributions to schools and communities of the Downeast Athletic Conference. Thank you Butch! Photo 1: Cheerleading All-Stars for this year include: WHS, Mackenzie Campbell, Halie Smith, Taylor Lane, Makayla Overlock; MHS, Ava Dray, Dani Vazquez, Taya Wood, Cam Leavitt, and Cross Country boys All-stars for this year include: J CHS, Kendra Parks, Payton Lozier, Mackenzie Bennett, Ivy McLellan. Photo 2: Cross Country boys All-Stars for this year include: J-B, Evan Merchant; Machias, Jacob Godfrey, Cameron Leavitt, Jakob Holland, CHS, Addison Coty, Kyle Richard; NHS, JP Snider, Blaine Grant, Kyle Davis; and SHS, Dylan Bernaquer, Nicholas Kimball. Photo 2: Girls Soccer All-Stars for this year include: CHS, Emily Mitchell, Katie Cavanaugh, Sydney Farrar; WHS, Paige Fitch, Jennie Cox, Anna Johnson, Sadie Smith; NHS, Kylee Joyce, Lance Perry, Diana Parades; Shead, Keisha Scott, Jacqueline Cook; and SHS, Gabby Richardson. Photo 1: Boys Basketball All-Stars for this year include: J-B, Isaiah Faulkingham, Ryan Alley, Adam Robinson; MHS, James Mersereau, Jacob Godfrey, Jordan Grant, John Massaad; NHS, Brettin Dinsmore, Cameron Rumery; WHS, Drew Hayward, Riley Russell; CHS, Addison Coty, Brandon Gillespie; and Shead, Matt Harris. Senior AcademicAll-Stars for this year include: NHS, Kayla Toppin, Blaine Grant, Hannah Bennett, John Paul Snider, Nicholas Willey, Caitlin Reynolds, Hayden Pineo; SHS, Issiac Christiansen, Noah Goldfarb, Margaret Perry, Anna Young; J-B, Georgia Backman, Jadah Alley, Douglas Hinkley, Joe McDonald; Shead, Matt Harris, Katelyn Mitchell, Holly Preston; MHS, Regan Bragg, Jonathan Massaad; CHS, Katie Cavanaugh, Koby Gillespie, Jack Lander, and WHS, Gabe Hunnewell. Boys tennis All-Starsfor this year include: CHS, Christian Emery, Gavin Altvater; SHS, Brandon Grinnan; Shead, Sam Tracy, Matt Harris; and WHS, Gabe Hunnewell, Charles Newman. 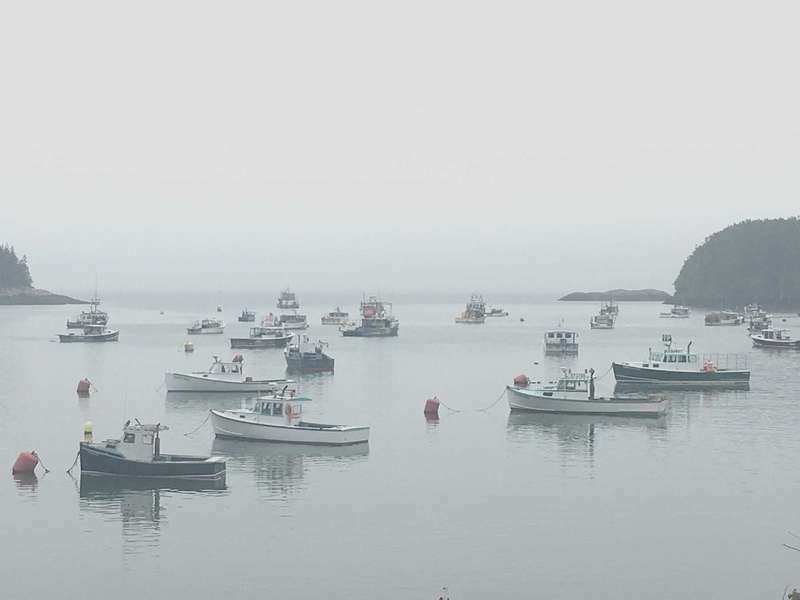 The beauty, ruggedness—and uniqueness—of America’s last coastal frontier will be featured in a multi-faceted exhibition of paintings, prints, sculpture and photography of Downeast Maine opening Wednesday, June 28 at the Lubec Landmarks Mulholland Market Gallery. 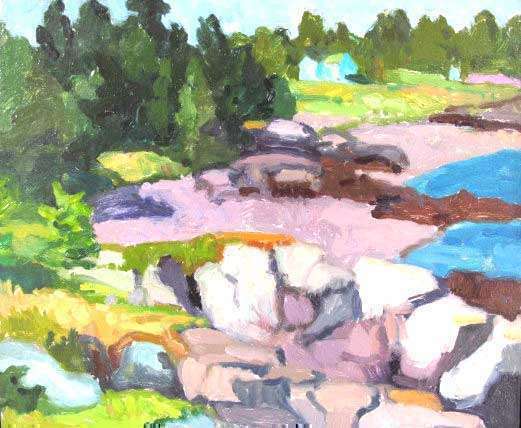 Lubec’s Crow Town Gallery’s first show of the 2017 season features three artists with distinctly unique visions of The Bay of Fundy and its surrounds; Shanna Wheelock, Kathrin Hilten, and Richard Van Buren. The show runs from June 29 to July 16, with the opening reception on July 6, at 7 p.m.
Members of the Hannah Weston Chapter, Daughters of the American Revolution (DAR) will gather for their annual picnic meeting to be held at the Gates House, home of the Machiasport Historical Society on Rt. 92 in Machiasport, at 11 a.m. Sat., July 8. Members attending are asked to bring a sandwich. Dessert and beverage will be provided. 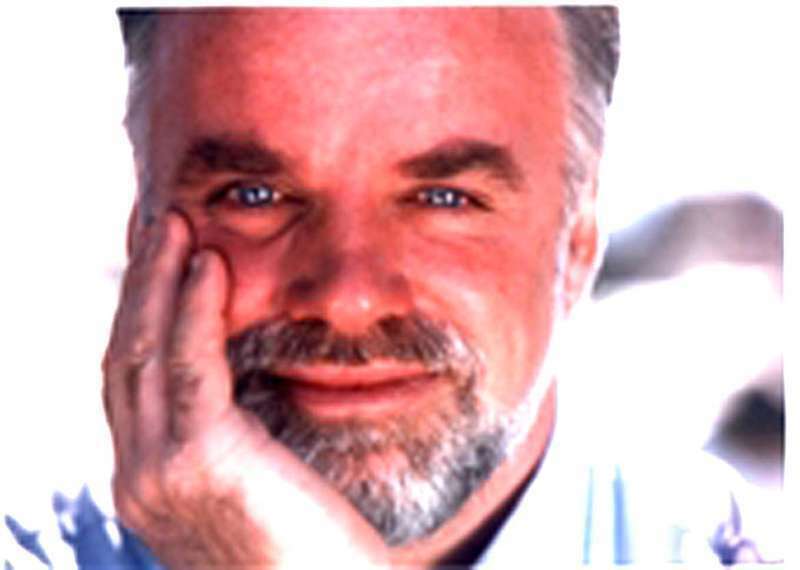 The speaker for the afternoon will be Valdine Atwood who will discuss DAR Insignia and Protocol. When summer rolls around, Porter Memorial Library does its best to make reading even more fun than ever. During a month-long Summer Reading Program in July, the library will feature book displays and reading lists of titles that can be found in the library collection; and also sponsors at least one cultural and learning event for families. 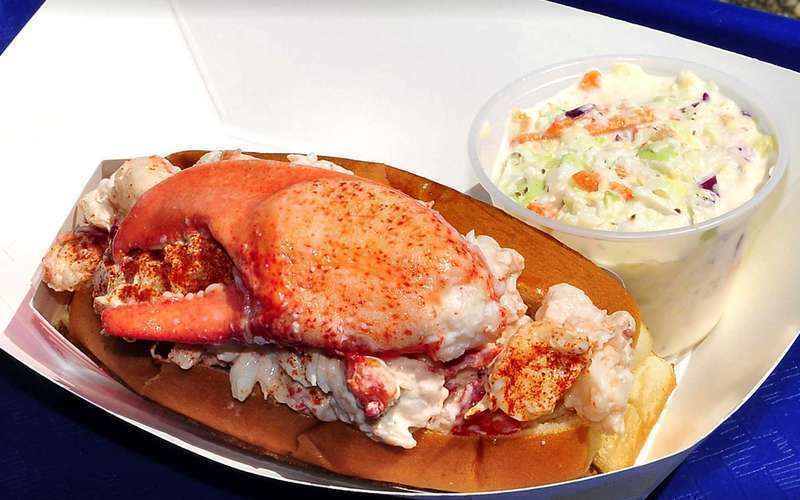 Friends of Fort Knox in Prospect and the St. Andrew’s Society of Maine present the annual, Scottish Tattoo on Saturday, July 8 at Fort Knox in Bucksport. The event features two marching bagpipe bands performing a “Scottish Tattoo”. The event takes place on the Fort Knox parade ground and begins at 5:30 p.m., Saturday, July 8. Tickets are only $10 for adults and five dollars for children under $12. Tickets may be purchased at Friend of Fort Knox gift shop or by calling 469-6553 or at Fort Knox the night of the concert. 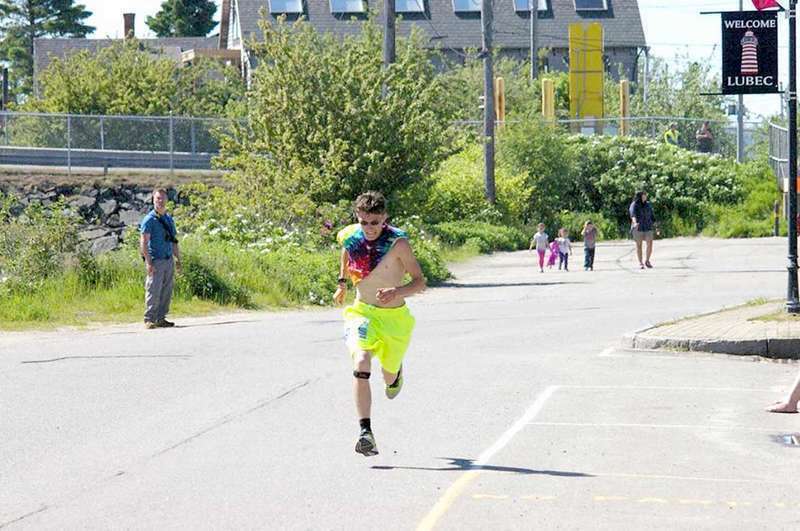 Evan Merchant, the Beals Island high school junior who outpaced more than 100 runners to win the Bay of Fundy 10-kilometer race in Lubec, was a month from finishing the fourth grade in 2010 when he entered his first road race. It wasn’t billed as a race, but rather the tenth annual Walk for Life, a fundraiser for a cancer support group started by one of his neighbors. Although the other participants walked the course from Addison’s town hall to Route 1 and back, Merchant and a school friend elected to run it. 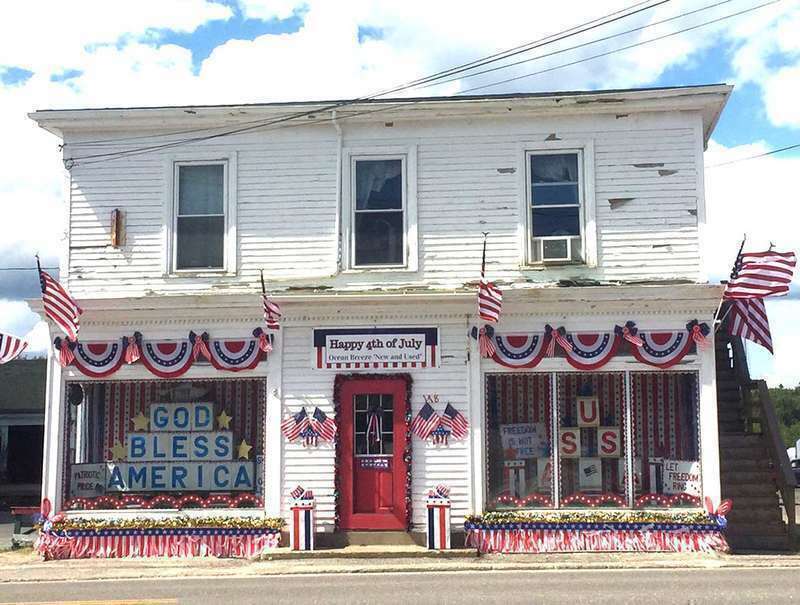 Donny Alley dressed up his rental in the old Jonesport System Store and took first place in decorated businesses. 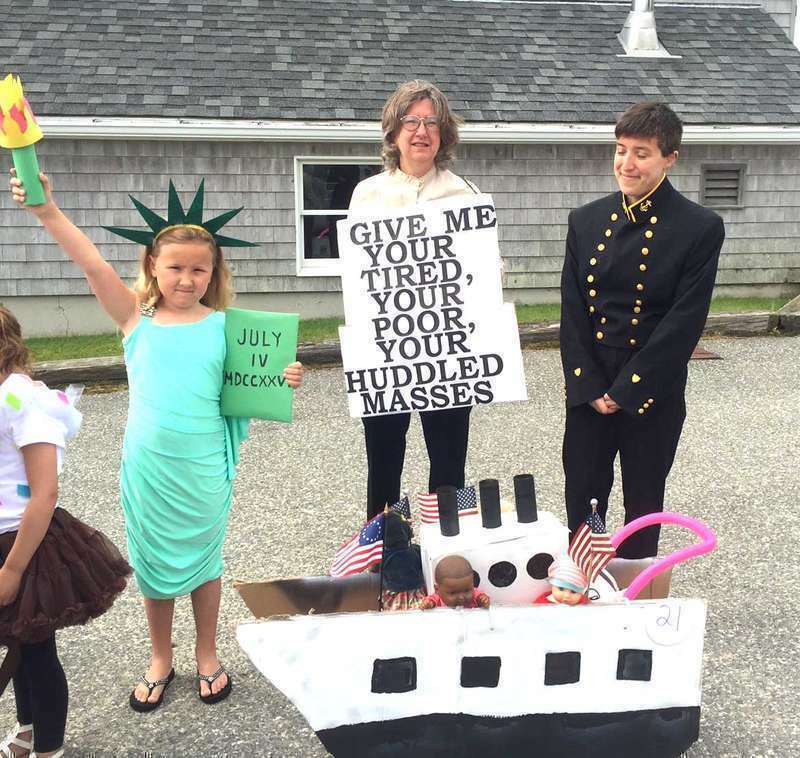 During the Moosabec Summerfest mini-parade which took place on June 30, local youngsters competed for most patriotic, most original and most humorous titles. Photos by Nancy Beal. 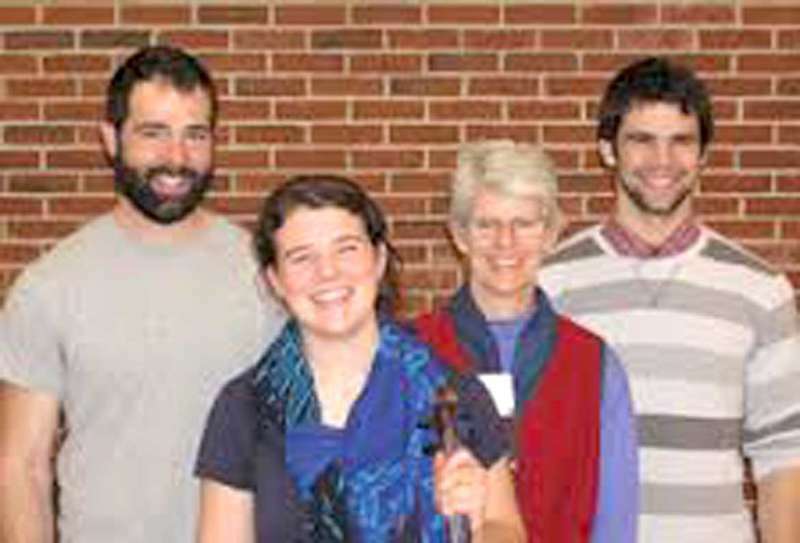 Porter Memorial Library in Machias is excited to announce a rare local appearance by a traditional New England contra dance band, The Sugar River Band, from Newport, New Hampshire. 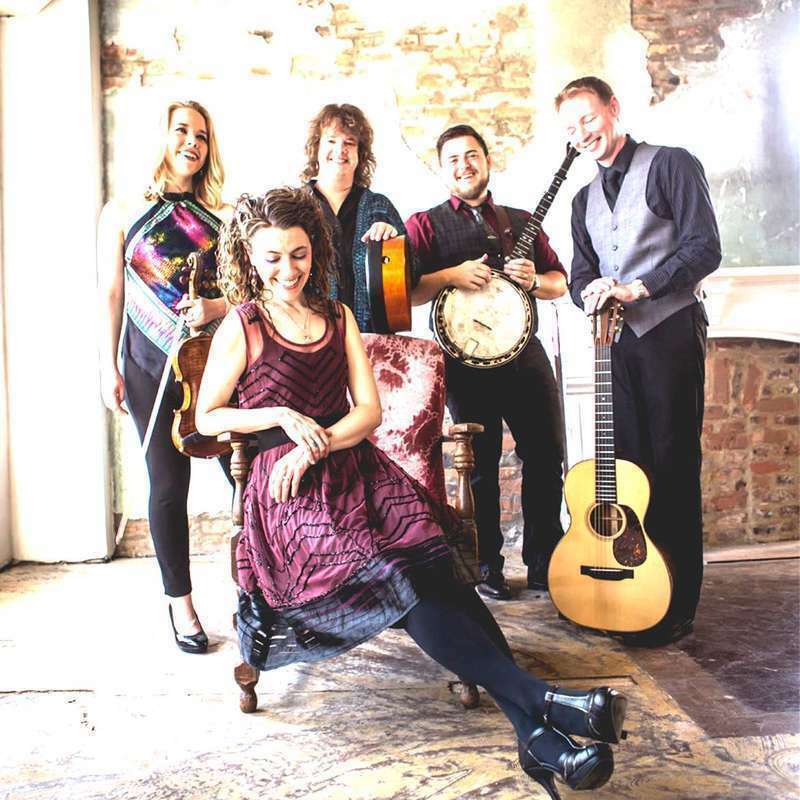 The Sugar River Band will perform at a Family Contra Dance and Potluck scheduled for Saturday, July 15 and sponsored by Porter Memorial Library as part of its 2017 Summer Reading Program. 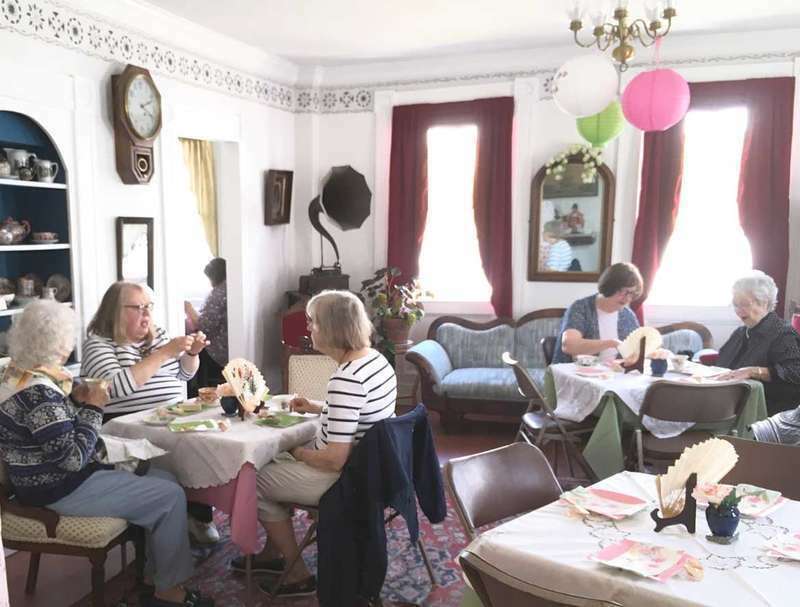 The July 15 dance and potluck supper will be held at the former Lubec Grange Hall in Lubec, now Artworksofmaine, located at 10 North Lubec Road across from McFadden’s Gulf Station on Route 189. The 2017 high school year is officially over and Downeast Maine and the Narraguagus Lady Knights had the most successful post-season out of the eight Washington County teams. The Lady Knights weren’t as successful during the regular season as a year ago, when they went 16-0. A year ago, the Knight’s undefeated record was misleading because of their weak regular season schedule, they ended up getting eliminated in the quarter final. The Shead High School Tigers turned the table on the Mars Hill Club this year, after getting eliminated in a prelim game 2-1 a year ago,. Central Aroostook a 2-0 lead in their June 6th game at Davis Field in Eastport. The Tigers tied it in the bottom of the third before the Panthers went ahead 3-2 in the fourth. Shead answered with two of their own in the fourth to take a 4-3 lead. After a scoreless 5th, Central Aroostook tied the game with a run in the top of the sixth. Kierstin Brewton, of Eastport, a major in the University of Vermont Class has been awarded a Critical Language Scholarship to study Chinese in Tainan, Taiwan during the summer of 2017. Matthew Plaisted was recently honored at the Husson University School of Education Awards Ceremony as the recipient of the 2017 Watch Award. The Watch Award is presented each year to the student with the highest GPA (Grade Point Average) in the School of Education. During his years as a student at Husson, Matthew was employed by the Husson Financial Aid Office, United Cerebral Palsy of Maine and, most recently, the Suzanne M. Smith Elementary School in Levant. Grade 3: High honors: Maya Henderson, Kieli Smith. Honors: Dawson Fielder. Grade 4: High honors: Thaddeus Bridges, Ava Fitzhenry, Chloe Gibson, Kaiden Wood. Grade 5: High honors: Austin Fitzhenry, Harland Inglis. Honors: Naomi Lauze. Grade 6: High honors: Ryley Ingrish, Jonathan O’Donnell, Garrett Sprague, Eli Tremblay. Honors: Lacy Gibson. Grade 7: High honors: Aviva Bridges, Elesia Berry. Honors: Caitlyn Link. Grade 8: High Honors - Caleb Sawyer. Honors - Blaze Luna. 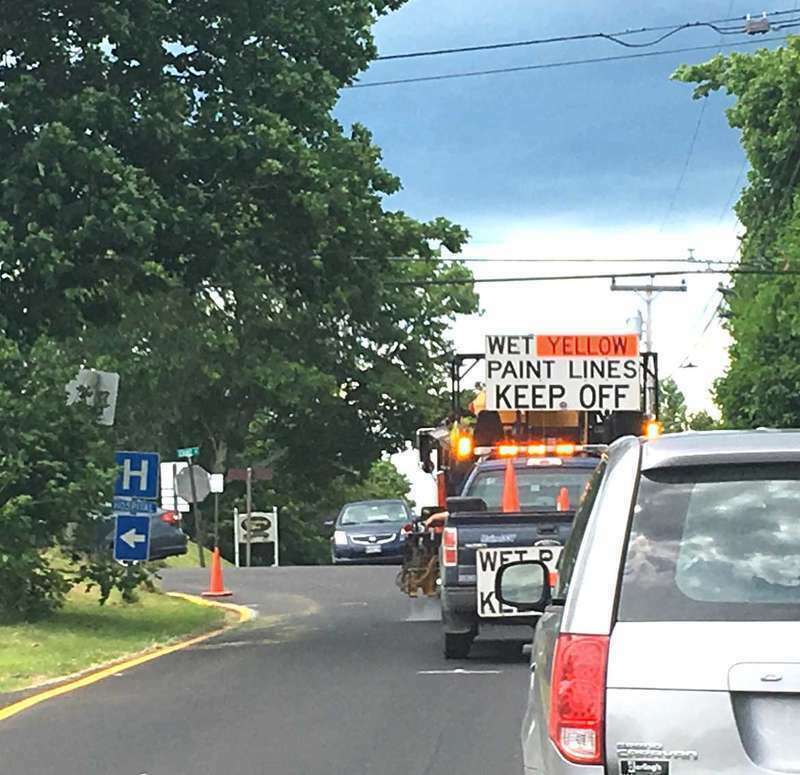 Painting trucks were a familiar sight in downtown Machias last week as the Maine Department of Transportation (MDOT) put the finishing touches on newly resurfaced roads like Free Street, Court Street and Broadway. The Machias Selectboard discussed the work at their meeting last Wednesday night. They said the MDOT has informed them that a crosswalk cannot be repainted on Court Street between Porter Memorial Library and the US Post Office because regulations require there to be no parking within 20 feet of a crosswalk. The University of Maine recognized 2,303 students for achieving Dean’s List honors in the spring 2017 semester. Of the students who made the Dean’s List, 1,727 are from Maine, 533 are from 29 other states and 43 are from 22 countries other than the U.S.Listed below are students who received Dean’s List honors for spring 2017, completing 12 or more credit hours in the semester and earning a grade point average of 3.5 or higher. Please note that some students have requested that their information not be released; therefore, their names are not included. The unrivaled king of the crates was Sean Griffith, who skipped across all 50 crates strung out for the Moosabec Summerfest lobster crate race June 30. 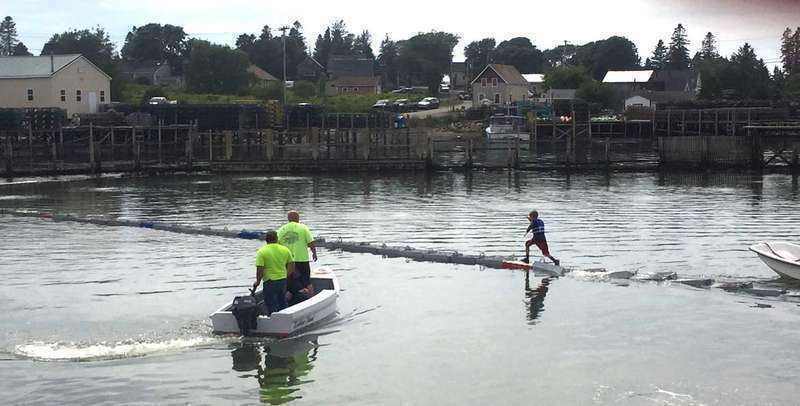 The Virginia youngster was ferried back to the launching platform and ran 41 more crates before plunging into the sub-60 degree waters of the Carver lobster pound on Beals’ Perio Point. Photo by Nancy Beal. 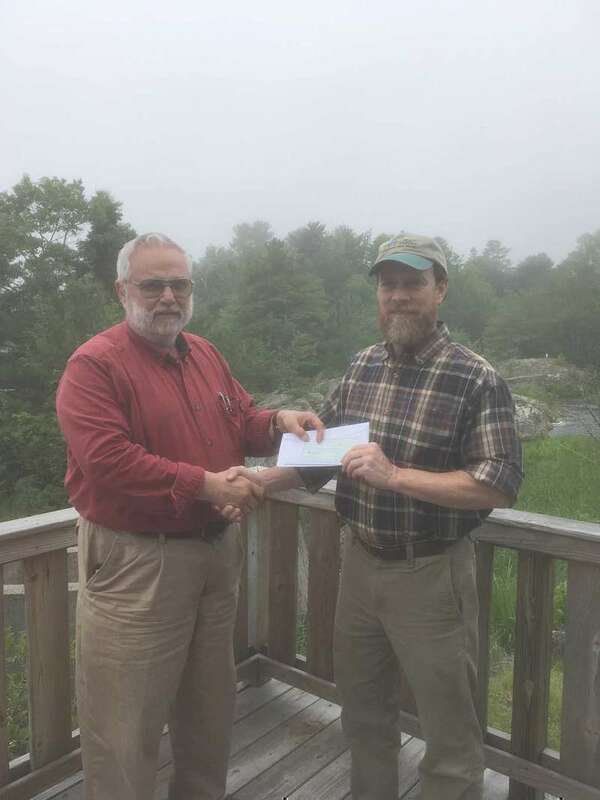 The Pleasant River Fish and Game Conservation Association (PRFGCA) has just gifted a donation of $750 toward the Machias River Conservation Camp youth scholarship fund. This is the second year in a row that the PRFGCA has donated toward the scholarship fund. 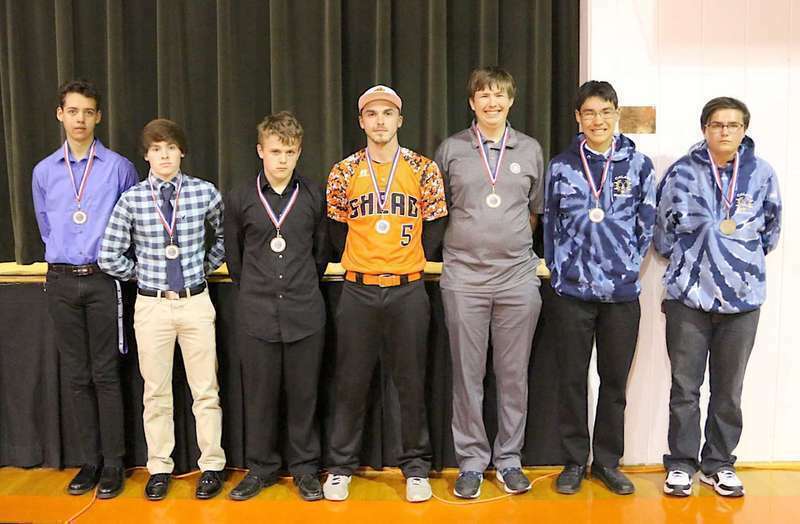 Several outdoor track athletes from Washington Academy and Narraguagus were recently selected to All Conference first and second teams by the Penobscot Valley Conference. The big name on the list was Michaila Robinson of Washington Academy. Robinson was a first team selection in the 100-meter, 200-meter and 400-meter dash. Robinson was a state title winner in the 200 and 400 and runner-up in the 100. Robinson was also a first team selection in the 4x400 meter relay along with teammate Sean Seavey, Garrett Channell and Colby Cates Wright. June 7th Senior Scrambles at Barren View Golf Course in Jonesboro was decided by a putt-off. The first three teams all recorded -4 while the 4th, 5th and 6th place teams recorded a -2. Julien Whitney teamed up with Fred Morgan, Jim Golike and Nancy Cunliffe to take home the big prize money. Last week’s winners were Jane Hooper, Stan Fitzhenry, Clint Libby and Gary Willey grabbed second place. The mayor of Bach Bay—Wayne Smith—together with Gail Berry, Ed Boland and Gordie Faulkingham finished 3rd. 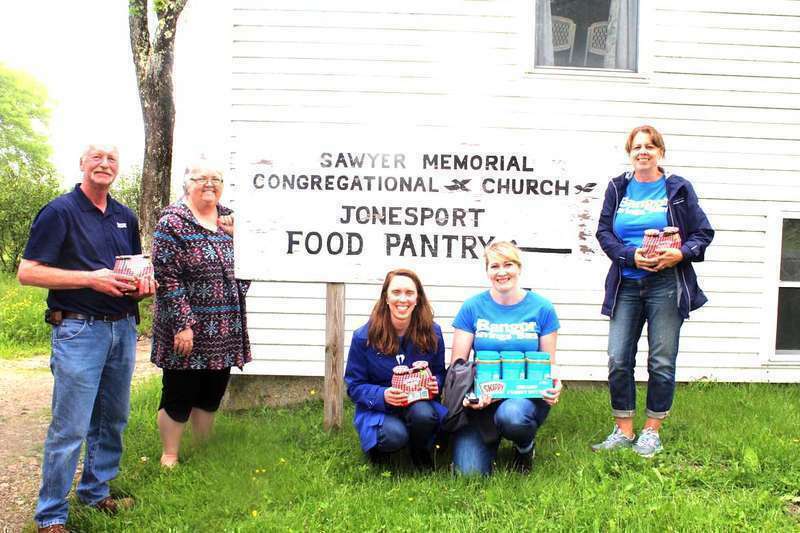 Good Shepherd Food Bank’s Food Mobile will be distributing food, including fresh produce, perishable and non-perishable items to people in need in the Machias area. Anyone in need of emergency food assistance in Machias and the surrounding area is welcome to attend. 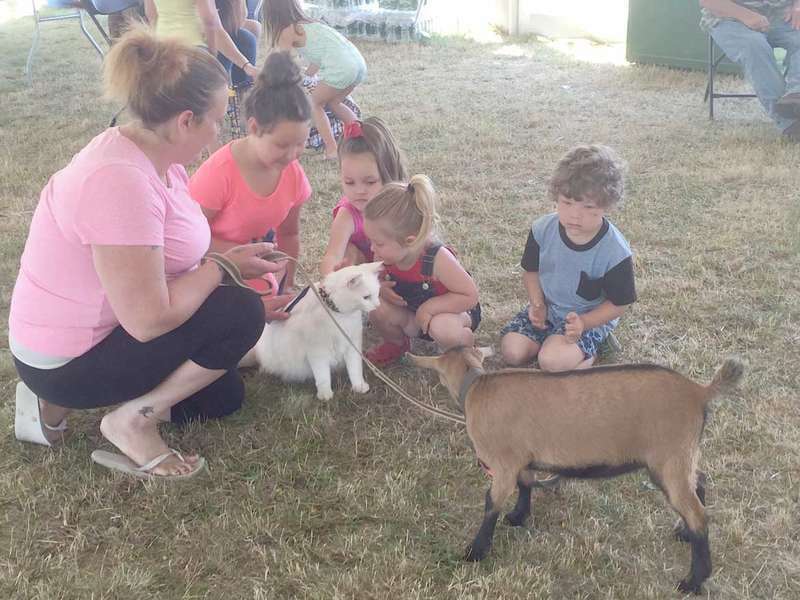 The event will take place on Wednesday, July 13 from 10:30 a.m. to noon and will be held in the Pellon Center parking lot, 90 Main Street, Machias. 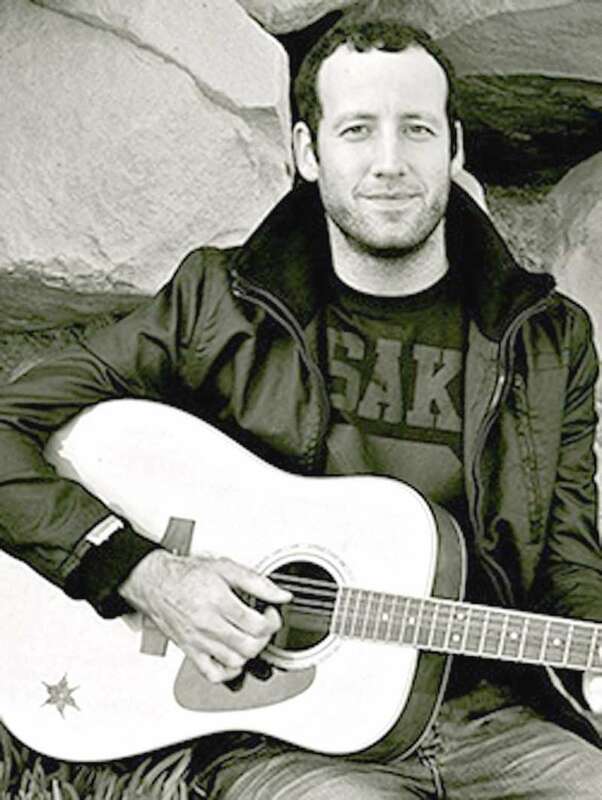 Ty Openshaw is an American musician and singer-songwriter born and raised in Downeast Maine. His popularity began during his middle school years as he supported touring bands that traveled near his home town. At a young age Ty began creating a guitar/vocal wall of sound using these two instruments in combination with mesmerizing electronics. With a voice that is raw, soulful and speaking emotional truth, Ty Openshaw engages listeners and encourages them to lose themselves in the melodic message he delivers. Husson University is pleased to share their Spring 2017 President’s List. 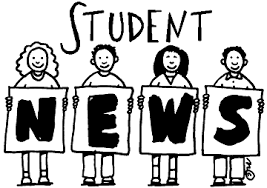 Students who earn President’s List honors must carry at least 12 graded credit hours during the semester and earn a grade point average of between 3.80 to 4.0 during the period. Weston Ranalli of Big Lake Twp, ME is a senior who is currently enrolled in Husson’s Bachelor of Science in Accounting/Master of Business Administration (MBA) program. Laura Barnett of Calais, ME is a senior who is currently enrolled in Husson’s Bachelor of Science in Healthcare Studies/Master of Science in Occupational Therapy program. 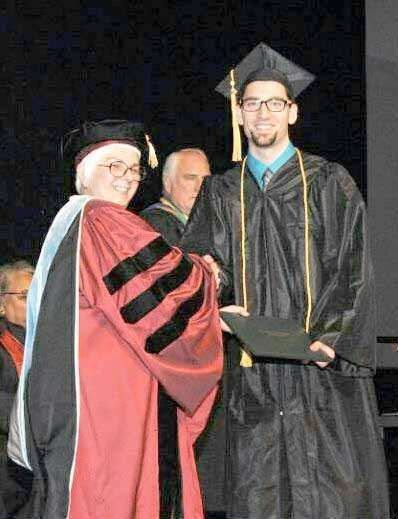 Dewey Sheehan of Pembroke graduated with a Bachelor of Science degree in Business Administration during commencement ceremonies on May 21, 2017, at the University of Vermont. The university conferred degrees this year on an estimated 3,228 graduates, including 2,620 bachelor’s, 386 master’s, 106 doctoral and 116 medical degree recipients. Among degree recipients are students from 40 states and 97 international students from 21 foreign countries. Approximately 1,116 graduates are from Vermont. All are invited to Washington Academy’s Adien and Leon Look field dedication on July 15 at 1 p.m. Join the festivities, including an alumni baseball game, free hot dogs and music. If you are a WA alum and are interested in participating, please contact the WA Development Office, 255-8301, ext. 220, or developmentoffice@raider4life.org. A variety of ventures, often inching forward one step at a time, are responding to the variegated urgent needs in Washington County. It didn’t happen overnight, and many of these enterprises are dedicated to staying, albeit facing a challenging survival. The Machias Marketplace, with its mantra of “local food for local people,” is now 12 years old. After a rocky start followed by seven years under Machias Hardware, it now has a new location adjacent to Posh and across from True Value. This mark, known as “The King’s Broad Arrow,” was placed onto the tallest, straightest white pine of colonial Maine. Anyone cutting a tree so marked risked serious punishment. These trees were reserved for use as masts and spars of His Majesty’s Navy. If Britannia truly “ruled the waves,” it did so through harnessing the wind into sails held in place by wood taken from the forests of Maine. 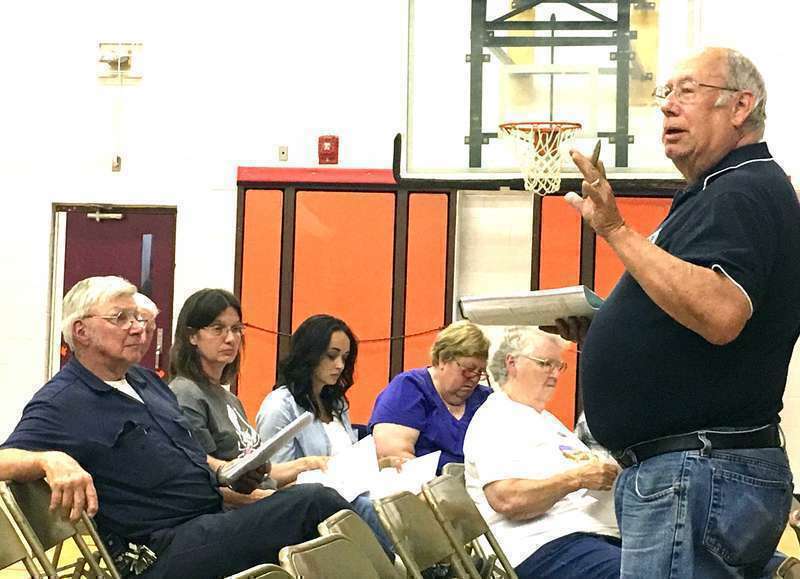 Machiasport voters approved 49 articles in 51 minutes at the annual town meeting last Monday night, including one which establishes Machiasport as a dry town for marijuana. Maine voters approved a referendum legalizing recreational marijuana for adults over the age of 21 during last November’s elections. The state then placed a moratorium delaying the sale of recreational marijuana until February 2018. Joseph Toschi came to Machias in the late 1800’s with his children and son-in-law, Ernest Mugnai. 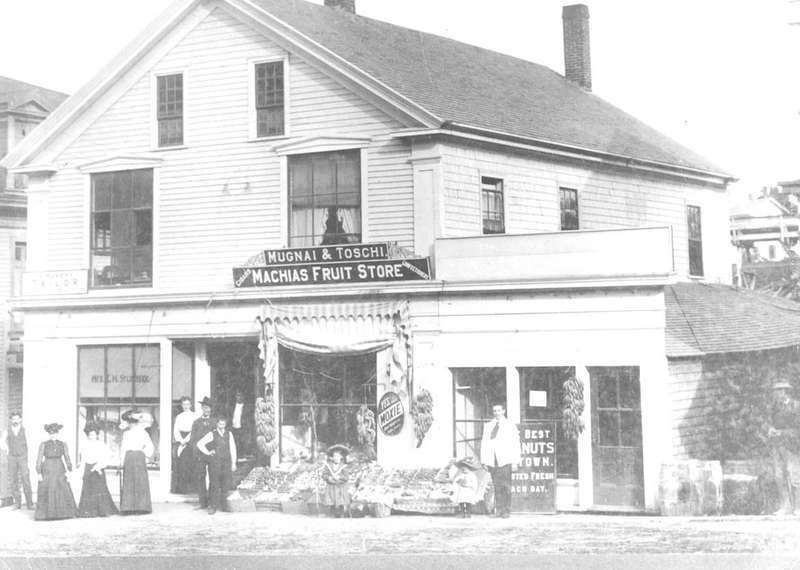 According to Mugnai’s great-grandson, Michael Hoyt, Mugnai imported fruit and candy by train from Boston to sell in his Machias fruit store. July in Washington County disproves the theory summer is full of lazy days. In this week’s paper alone you’ll find news of something fascinating, enriching, musical or physical to do nearly every day of the month. 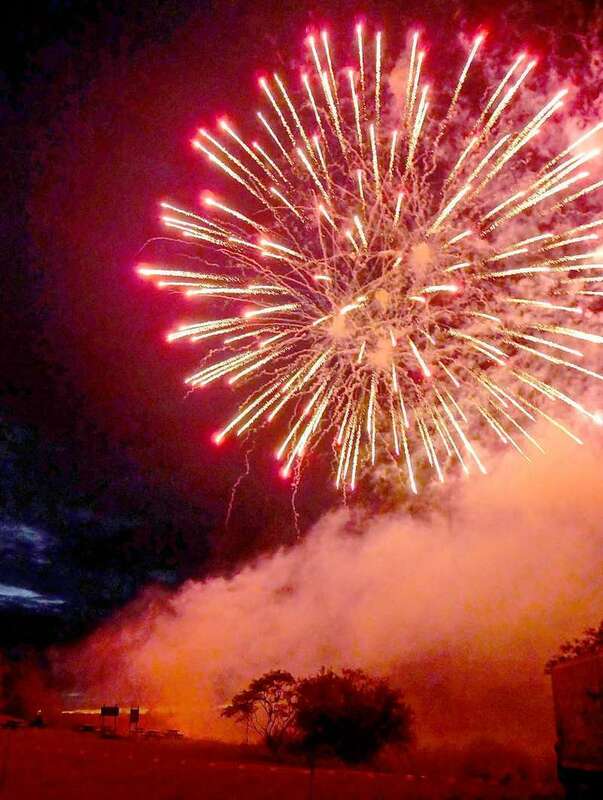 The Fourth of July aka Independence Day is etched into America’s playbook as a day of phenomenal thankfulness. As well it should be. The Continental Congress 241 years ago declared that 13 struggling American colonies were a new nation -- the United States of America -- and no longer under the direction and dictates of the British Empire. Summer’s wild blueberry creations become autumn’s scenery -- grand beyond conception. Maine’s wild blueberries are different because nature got it right! Our unique and special wild lowbush blueberries grow on plants that Mother Nature gives us from underground vines (rhizomes), and their above-ground fruit-bearing low bushes four to 10 inches tall. 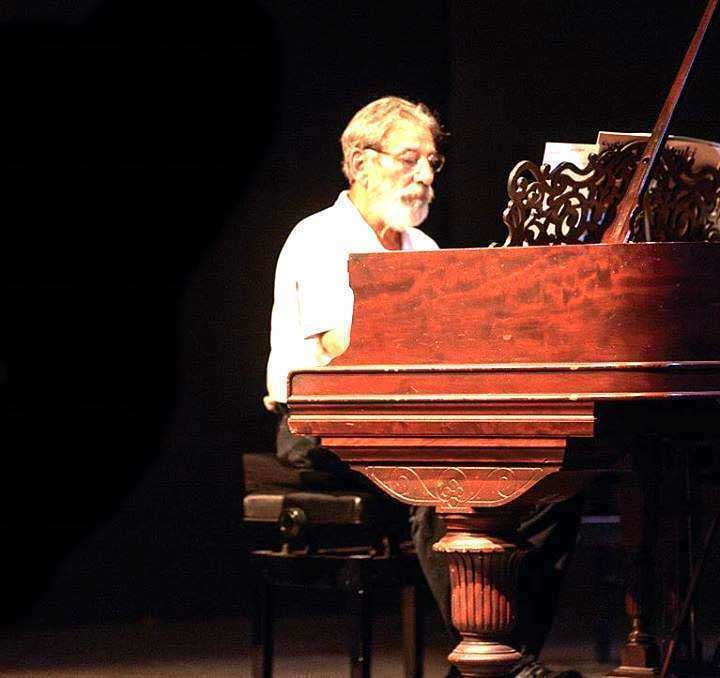 On Tuesday, July 18 at 7 p.m. Machias Bay Chamber Concerts (MBCC) will present “An Evening with Paul Sullivan”, the Grammy Award-Winning pianist and composer. 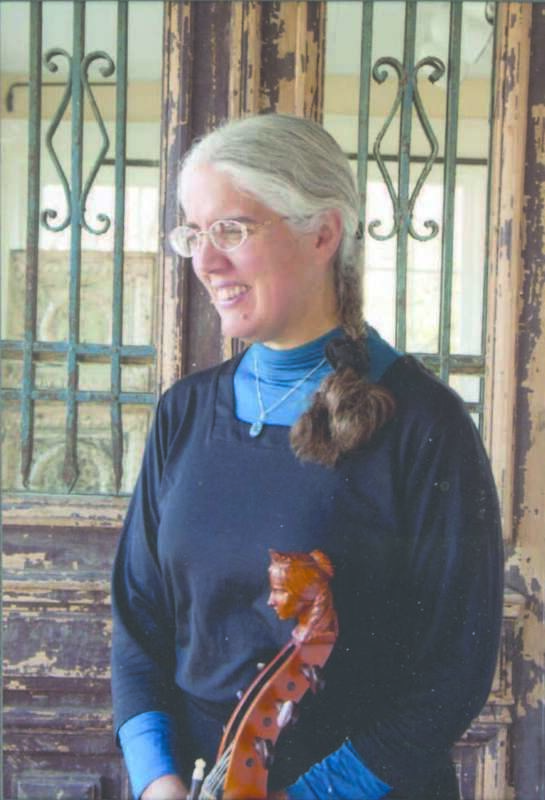 The concert will be held in Centre Street Congregational Church, Machias. Andy and I helped George and Patti pack up and move to Chelsea last Sunday, July 2. They left a lot of things for Wesley Historical Yard Sale planned for Saturday, July 22. Also got a couple of boxes from Dotty Baker for yard sales, plus Dotty donated a few things to the Historical building. Leo Hayward has been donating his time at the Wesley Historical building on Saturday from noon- 4 p.m. through July. If you see the “Open” flag, stop in and have a look around. 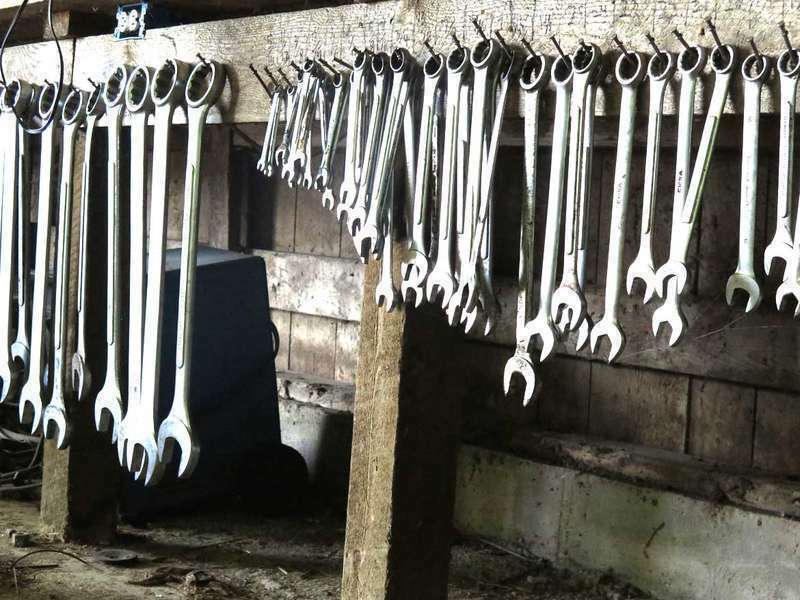 There are a lot of pictures and reading to do and a lot of old tools from this area. Whether you are a true “Downeaster,” a transplant “from away,” a “summer person” or a tourist who is just passing through,” you will have a chance to hear a musical tribute to Maine’s historic and heroic outdoor workers. The Pembroke Library presents “Maine Woods – Maine Waters” on Wednesday evening, July 19. Songs of working “in the woods,” “driving” logs down flooded rivers, watching the coastline, harvesting the fish of Maine’s waters and Maine ships sailing to and from far away places can be heard at the Pembroke Library Chantey Sing. When Maria Lamb wanted her business to do more than help vacationers discover the beauty of Downeast Maine, she turned to a global nonprofit. 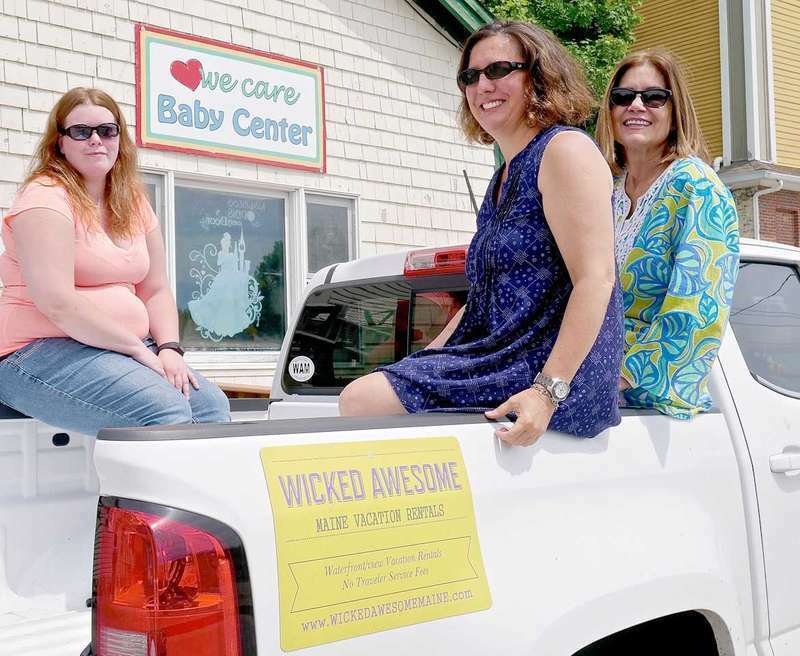 Maria Lamb, owner of Wicked Awesome Maine Vacation Rentals in Machiasport, joined Pack for a Purpose, which encourages travelers to use their luggage to carry supplies to donate in their destination community. People began lining the Machias parade route more than two hours before kickoff on July 4. Photo courtesy Casey Kilton. This aerial view of the Machias dike shows cars lining the roadside at dusk in order to secure the best seats in the house for the Machias fireworks. Photo courtesy Casey Kilton. Machias Bay Chamber Concerts is excited to announce the 2017 summer series. July 11th— Gregory Bliss - paino, Trond Saeverud - violin, Anna Maria Baeza - clarinet, Joachim Woltun. Magic show — 10 a.m. July 12 at the H.D. Moore Library in Steuben. Conjuring Caroll will present children’s show called Building Blocks. Free. FMI: 207-546-7301 or email jbenedict@msln.net. Photo 1: “Life is how you frame it,” said McGinnis, a creative photographer and writer. 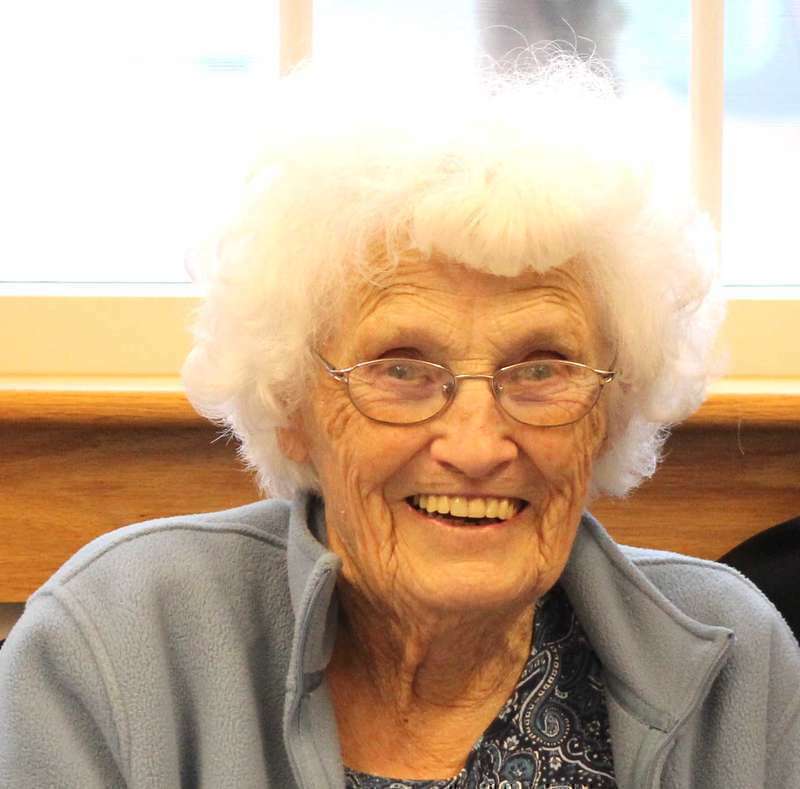 Her art reflects her Maine adventures, her sense of humor and inspiration “that can be found everyday if you look for it.” McGinnis’ art will be on display all month at the Henry D. Moore Library in Steuben. Submitted photo. Photo 2: The work of artist Nancy McGinnis is on display all month at the Henry D. Moore Library in Steuben. Submitted photo. Maine Attorney General Janet Mills announced July 10 that she is running for Governor. Although the Downeast Correctional Facility has been funded for another year, due to the dogged, unrelenting efforts of Sen. Joyce Maker and Rep. Will Tuell, years of heavy-duty fighting to keep this prison operating tells us we’ve only been granted a temporary reprieve. The Bold Coast Sea & Sky Festival will host its second annual unconventional Sprint Triathlon at 7 a.m. on Saturday, July 22. This race will be an opportunity for athletes, and their supporters to experience beautiful Downeast scenery, the world’s biggest tides and, if they are lucky, bald eagles. This is an excellent course with no traffic lights and no crowding. 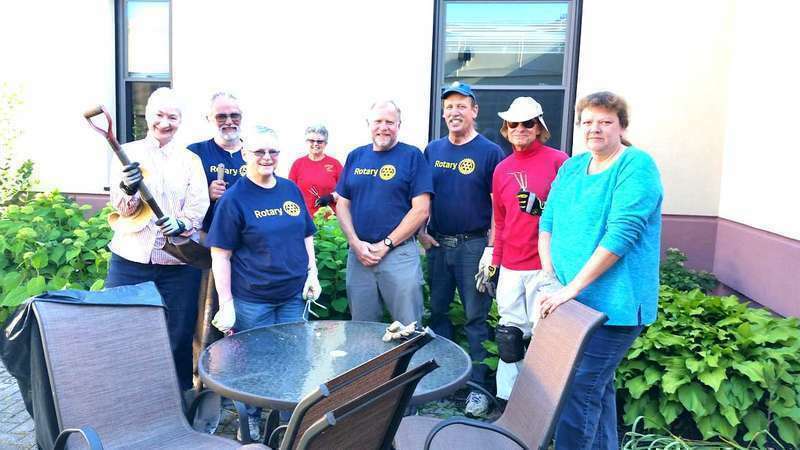 In 2015, members of the Machias Rotary Club donated their time and hard work to reclaim the beauty that once was the Down East Community Hospital (DECH) courtyard. They weeded, cut back old growth and then planted hundreds of tulip bulbs. Since then Master Gardener Susan Carlton has added her expertise, along with many plants. A meeting of the Washington Co. Historical & Genealogical Society will be held at 1 p.m. on Saturday, July 15 in the Emergency Management Room, 28 Center Street in Machias. Consolidated Communications Holdings, Inc. (NASDAQ: CNSL) announced last week that it has completed its acquisition of FairPoint Communications, Inc. (NASDAQ: FRP), in an all-stock transaction valued at approximately $1.3 billion including debt and based on present equity value. The merger further positions the company as a leading broadband and business service provider across a 24-state service area. In the early morning hours of July 10 the Machias Police Department responded to a call reporting a stabbing victim. 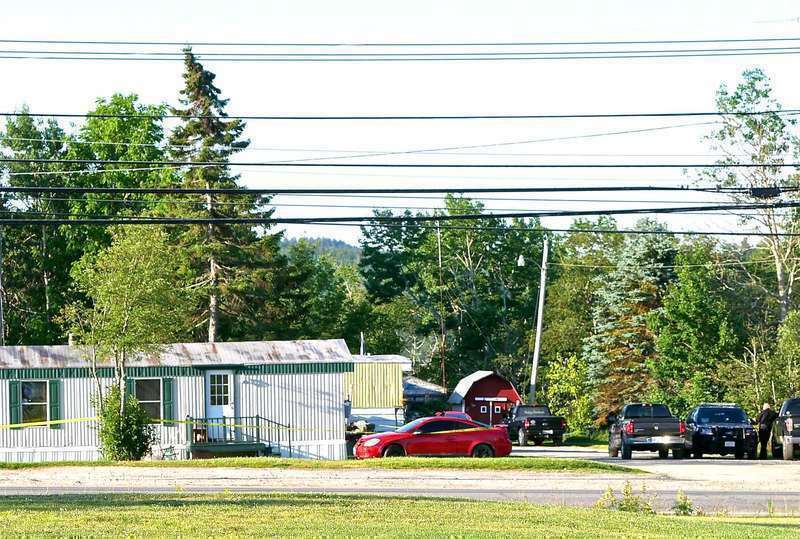 Chief Grady Dwelley said that the call came in between 3:15 and 3:30 a.m. and the stabbing occurred in a trailer on Sprague Way in Machias. A K9 unit was called to the scene, but its search was unproductive. “The victim was removed by the Machias ambulance service alive and reasonably well and taken to the Down East Community Hospital,” said Dwelley. Senator Angus King spent a day in Washington County last week. After touring the Eastport Health Care Clinic, he came to Machias for lunch at Helen’s and a visit to the Down East Community Hospital. I had a chance to sit down with him between his appointments, and that story is on our front page. As many of you may be aware, the biennial state budget that was passed last week included a cut of $5 million per year to the Fund for a Healthy Maine’s allocation for prevention services aimed at improving public health. U.S. Senators Susan Collins and Angus King and Representatives Chellie Pingree and Bruce Poliquin announced last week that the United States Department of Agriculture (USDA) has approved up to $10 million to purchase Maine wild blueberries after the Delegation requested the Department take action earlier this year. Bonus buys help protect American farmers from unexpected market conditions by purchasing surplus goods and distributing them to food banks and other charitable institutions. Calais Celtic Concerts will once again present the popular Irish Celtic Group, RUNA, at the Calais High School on Friday July 14, at 7 p.m. EST, 8 p.m. AST. RUNA’s performances have something for everyone: beautiful singing, exciting and driving Celtic Instrumentals, and Irish step-dancing. 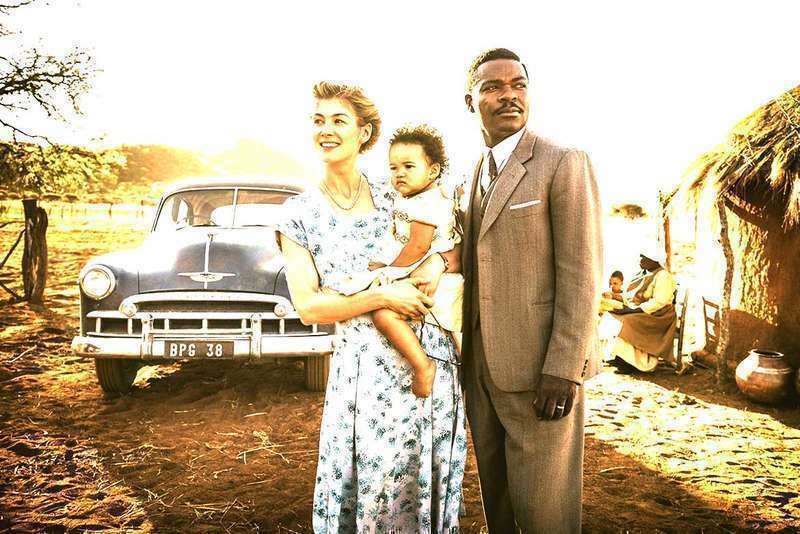 “A United Kingdom” is the next film in The Grand’s series of great recent movies. See this absorbing look at a historic, true-life love story the way the director made it to be seen—through a brand-new digital projection system—on Tuesday, July 18. This weekend Duane Smith and Mark Smith paired to shoot the low round on Saturday in the annual Member/Guest tournament at Barren View carding a 44. In this net event Lenny Espling and Cory Brooks were the next best posted net score with a 45. The two low gross rounds for the day were earned by Jack Clay/John Clay and John Smith/John Rogers both at 63 or 7-under. Following are all the top scores in the event. A much-watched race was the one between Jonesport brothers Oscar and Derek Beal who both captain Wayne Beal 36-footers powered by 500 hp engines. Oscar’s Papa’s Pride outdistanced Derek’s Miss Badonkadonk. Photo by Nancy Beal. 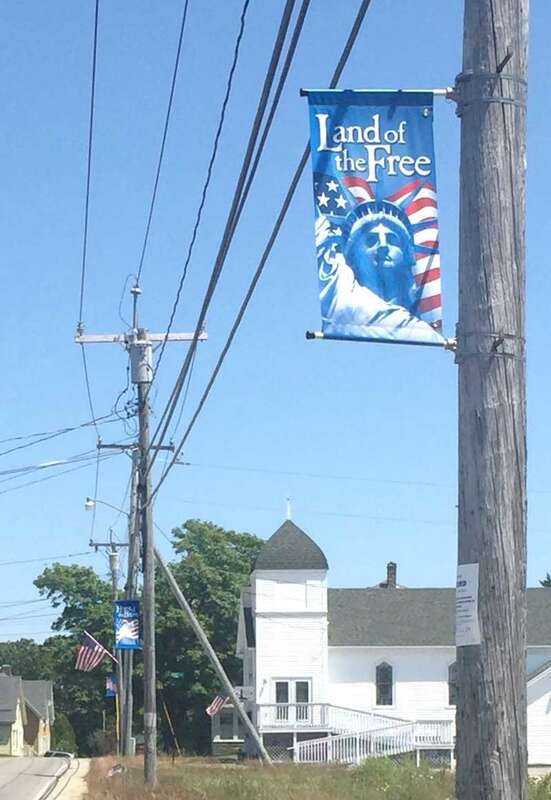 The recent appearance of patriotic banners on Jonesport’s utility poles prompted a minor flap on social media from citizens who erroneously thought they had supplanted the American flags that traditionally graced the town at the Fourth of July. In truth, the flags were put up, but moved to locations that were “safer for the flags,” in the words of Sue Mills, secretary/treasurer of the town’s July 4th committee. With 89% of people in Maine receiving between five and 30 nuisance calls per week, telephone scams are still causing major problems for consumers. The issue has become so widespread that almost a fifth of Maine adults admit they have been a victim of a telephone scam. Porter Memorial Library is sponsoring a family contra dance and potluck at Lubec Grange on July 15 as part of the library’s summer reading program. This special event is open to the public, especially to families with children, and features a traditional New England contra dance band from Newport, New Hampshire called The Sugar River Band. During the evening’s festivities, a self-serve potluck buffet will be available on side tables in the dance hall for the enjoyment of participants. Attendees are invited to bring something to add to the table. 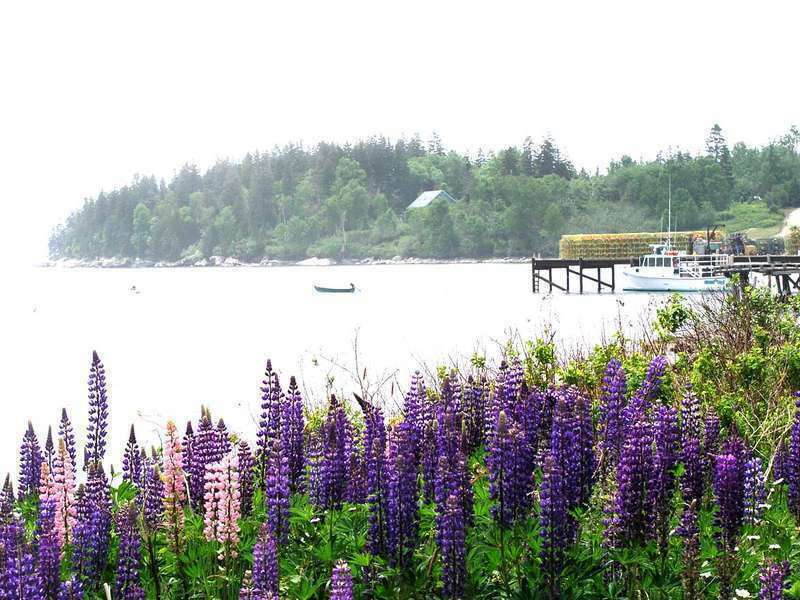 Dramatic scenes from Down East Maine—from landscape to beautiful closeup—will be featured in the 6th annual Lubec Photo Workshop show, running July 12-25 at the Lubec Landmarks Mulholland Market Gallery on Water Street, Lubec. The opening reception, free and open to all, will be Saturday July 15 from 5-7p.m. 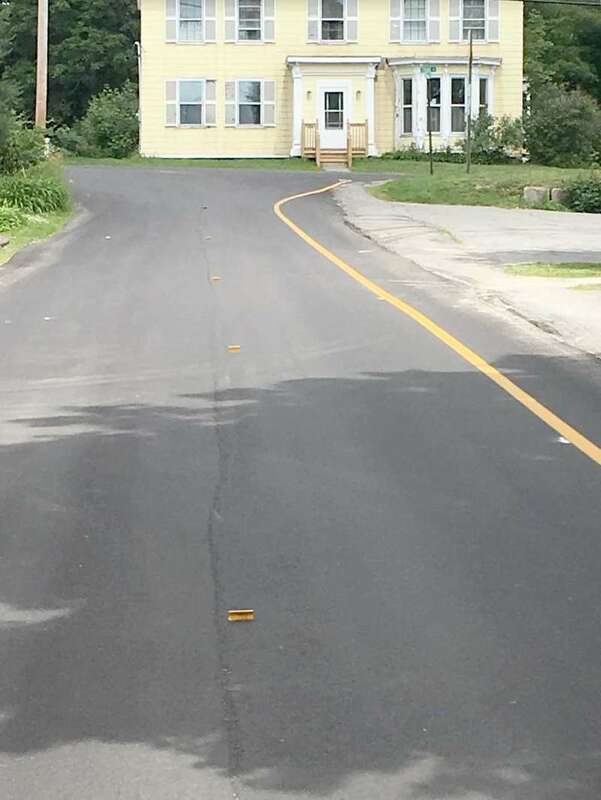 The Maine Department of Transportation (DOT) has been busy repaving and painting roads in and around Machias. The unusual line configurations painted onto Free Street, shown here, and on the short one-way stretch of Broadway have raised eyebrows. Machias Town Manager Christina Therrien said that the state has recently taken over responsibility for both stretches of road because they are essential connectors to Route 192 and Route 1. The SummerKeys Music School for adults in Lubec continues to expand the world of art, music and photography to the hundreds of students who flock from near and far to the rocky Downeast coast for a “Music Vacation”. This summer we again enthusiastically welcome Jennie Litt and David Alpher as instructors and performers of cabaret, “an intimate musical art form in which the performers put their personal stamp on a song through honest interpretation of the lyrics”. Congratulations to Machias Cross Country Coach Cindy Rossi for being selected by her peers as the 2016 Coach of the Year! Congratulations to Machias Cheerleading Coach Michelle Wood for being selected by her peers as the 2016-17 Coach of the Year! The Narraguagus Lady Knights came about as close to upending the top seed and advancing to a regional final as a team could do. The Knights got a superb no-hit pitching performance from sophomore Lanie Perry in their semi-final match up at Lincoln against the undefeated and top seeded Mattanawcook Academy Lynx. Luck was not on the Knight’s side as the Lynx scored a first inning, unearned run and pitcher Haley McLaughlin was able to make it stand up. The University of Maine at Machias High School summer league for boys and girls got under way June 19th with varsity and junior varsity girls action. UMM varsity mens’ and womens’ coach Troy Alley is once again the league’s director. Varsity girls teams entered this year are Shead, Woodland, Washington Academy (WA), Narraguagus, Calais, Jonesport-Beals and Sumner. The junior varsity teams; Woodland, Narraguagus, Calais and East Grand of Danforth. The Machias Area Little League was established in the mid fifties and is now over 60 years old. The league services players from Jonesboro in the west, to Whiting in the east, and all points in between. Several outstanding players have started their baseball careers with this fine organization. Seniors - High Honors: Robin Fay Brown, Morrison, Blaine Grant, Dakota McGuire, Rosemary Nguyen, Kayla Toppin, Dexter Wright. Honors: Destiny Belanger, Hannah Bennett, Juan Jose Castillo Perez, Jisselle Curtis, Kyle Davis, Josie Kinane, Hayden Pineo, Noah Ramsdell, Thomas Ray-Smith, Caitlin Reynolds, Cameron Rumery, John Paul “JP” Snider, Logan Staples, Philip Taylor, Nicolas “Cole” Willey. Juniors: High Honors: Taylor Colbeth, Sophia DeSchiffart, River Fenton, Mary Hammond. Machias’ Pat’s Pizza will be donating the proceeds from any Fresh Veggie Pizza sold on Tuesday, July 18 to support Healthy Acadia and the Beth C. Wright Cancer Resource Center’s cancer prevention, education, and treatment services in Washington and Hancock counties. The restaurant hosted similar events in May and June. The partnership is part of Healthy Acadia’s Hungry for Health 2017 campaign to “Challenge Cancer Downeast”. This is the second year of the annual “Hungry for Health” campaign, which addresses a critical community health need each year. 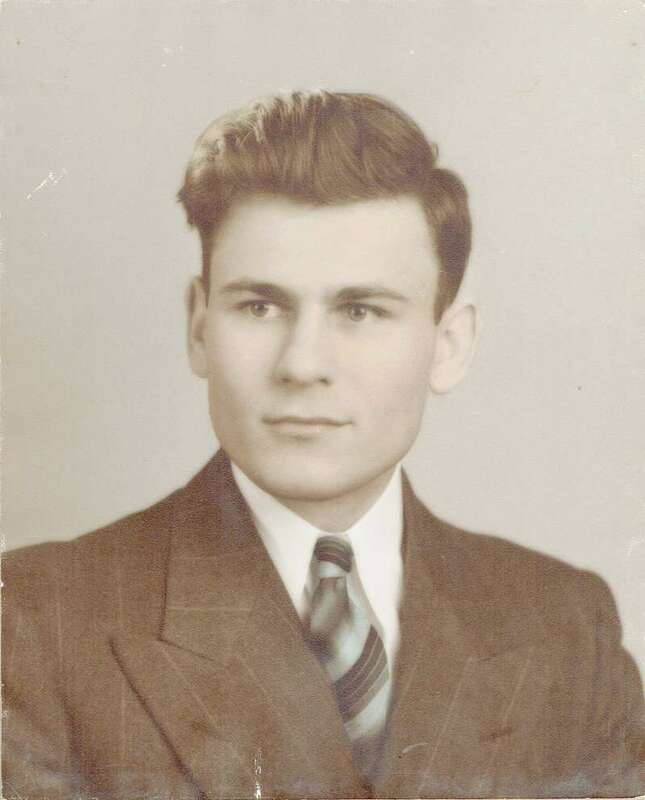 Joseph P. Waag of Cutler died peacefully on June 27th, 2017, at Down East Community Hospital. He was 96 years old. He is survived by his beloved wife Joan, his brother Charles of Long Island, NY, his children Christine Laurel and Anneke Waag of Cutler, Erica Marine of Rhinebeck, NY, and Robert Brandt and his wife Barbara of Brewster, NY. He will also be missed by his grandchildren: Samantha, Trevor and Andrew Marine, and Colleen, Christopher and Carolyn Brandt. Blood donations have fallen short of expectations for the past two months, resulting in about 61,000 fewer donations than needed and causing a significant drawdown of the Red Cross blood supply. The shortfall is the equivalent of the Red Cross not collecting any blood donations for more than four days. 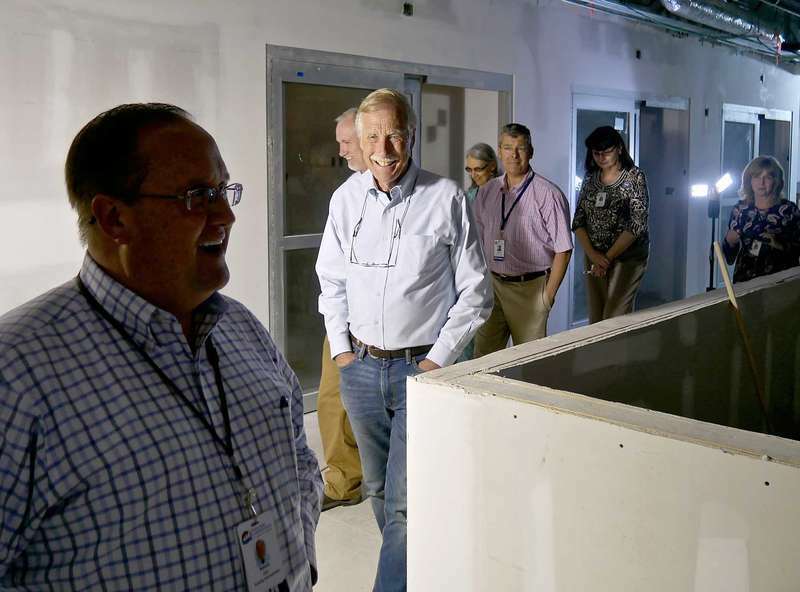 In advance of the Senate’s vote on its replacement for the Affordable Care Act (ACA), Sen. Angus King (I-Maine) spent time in Washington County touring health care facilities and talking with local care providers. Tariffs, shrinking profits and inflationary subsidies all contribute to a shifting, unbalanced wild blueberry market coming to a head on the Washington County, Maine-Canadian border. After a three-day government shutdown that kept legislators in Augusta into the early hours of July 4, the Maine legislature adopted a biennial budget that guarantees one year of funding for the Downeast Correctional Facility (DCF). The low-security state prison, located in the Bucks Harbor village of Machiasport, provides more than 45 jobs to the local economy. Mark Eves has officially declared his candidacy for governor of Maine in the 2018 election. Eves made the announcement in a broadcast on Facebook from a backyard BBQ at his home in North Berwick, where he was joined by more than 150 family members, friends, and supporters. With the first regular session of the 128th Legislature coming to a close in the very near future, Representative Will Tuell (R-East Machias) took a few minutes last week to review some of the issues he and fellow Washington County legislators on the Marine Resources Committee dealt with this past winter and spring. We have been over to Ralph’s to give him some trout. I tried to get pictures of his beautiful garden. The sun was so bright, but we got at least two. One is Ralph standing the rows.This is the only time I wished it to be cloudy. His garden is so beautiful, and he does all the planting, weeding, and watering if needed. He uses horse manure from here and says that is why he had such good luck. He is a wonderful friend and gardener. 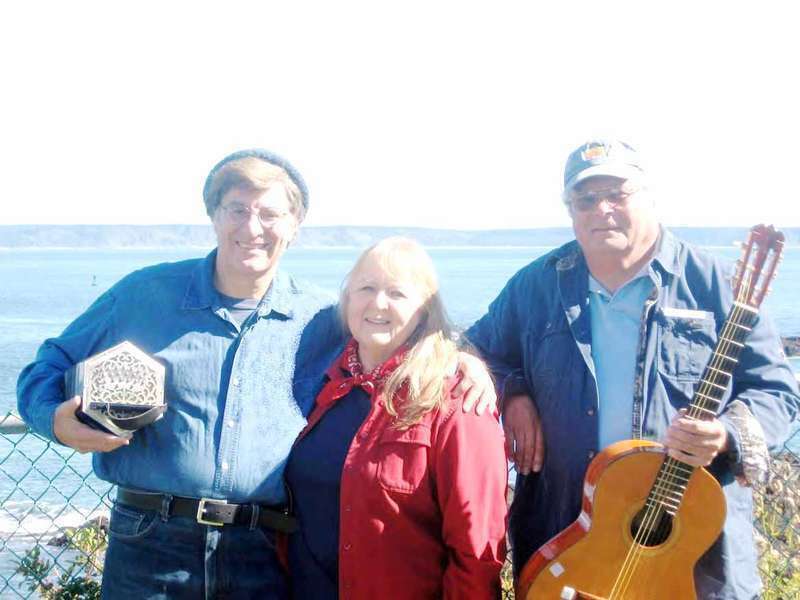 The July 24 meeting of the Machiasport Historical Society will feature a concert by “From Away Down East”, America’s easternmost sea chantey group. The group will present a program of historic songs about Maine Woods and Waters: songs about lumbermen, river drives, fishing and working and sailing on the coastal waters. 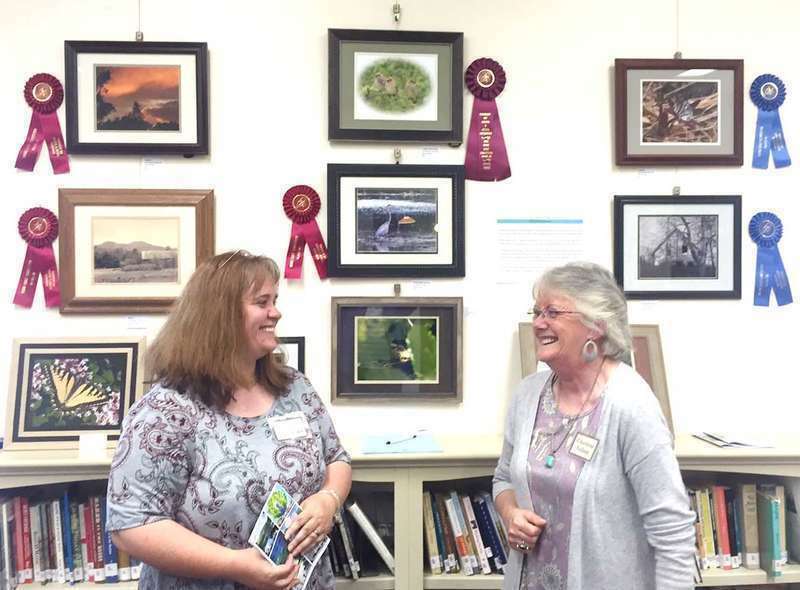 Nichole Gulowsen is the featured artist in the latest art show at Jonesport’s Peabody Memorial Library entitled “Artists of the Moosabec,” which opened July 15. Gulowsen is the daughter of art committee chairman and Charlene Nelson, a renowned Jonesport bird carver whose late husband, Robert, introduced Nichole to bird carving at the age of 10 after which she went on to win numerous awards for her carvings. Annie B. 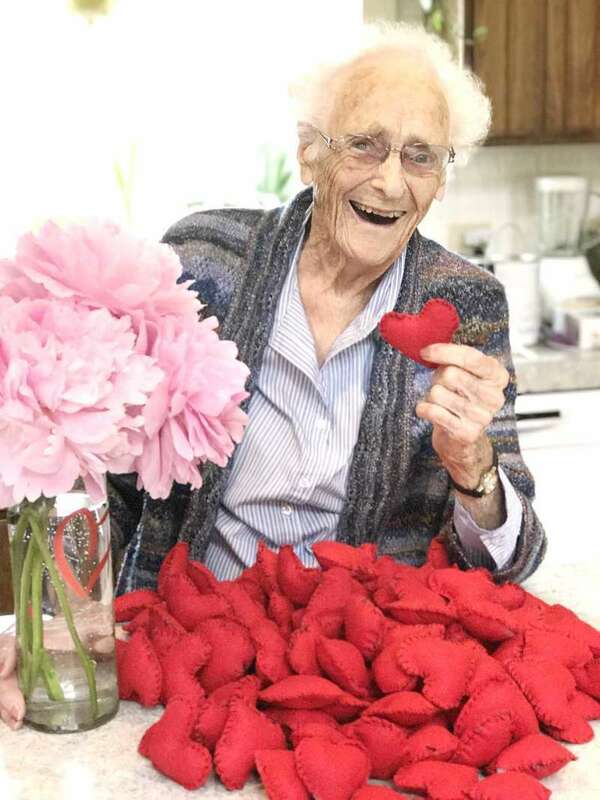 White, a native of Jonesboro who now resides at Changing Tides Residential Care Facility in Harrington, has been busy sewing and stuffing felt “Bridges” hearts. The Mary Bridge Children’s Hospital & Health Center is a pediatric hospital located in Tacoma, Washington where the red velvet hearts were originally handed out to children in the cardiac support group. Over the years, this practice has expanded to include many hospitals worldwide. 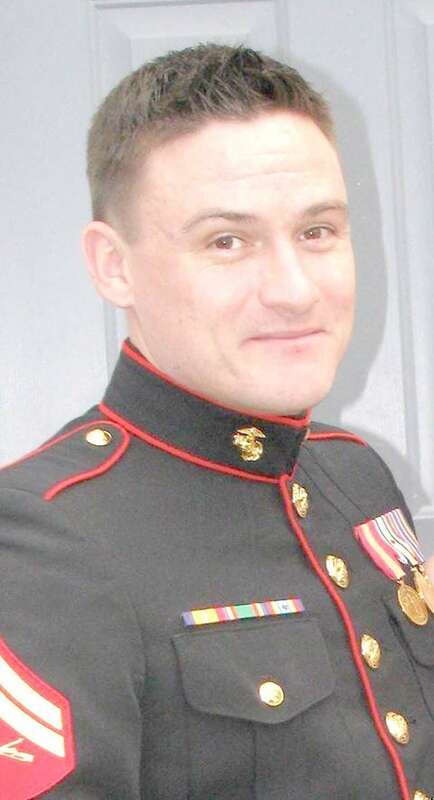 In March, the life of United States Marine Corps SGT. James “Jimmy” LaPrade was cut short as he was making the transition from military life to civilian life. Ruth Moore (USN) learned that he had a personal goal in life—to climb to the summit of Mount Katahdin. Moore is the founder of the Washington County veteran services organization, INTERNITY.